The necklace pictured is from the ‘Cymric’ line of jewelry sold at the London retailer and design firm Liberty & Co. ‘Cymric’ jewelry capitalized on the aesthetics of the Arts and Crafts movement, but disregarded most of its founding principles. Liberty & Co. aided in spreading the Arts and Crafts jewelry style across greater echelons of British society. Launched in 1899, the ‘Cymric’ line featured the typical characteristics of Arts and Crafts movement jewelry and appeared to be handmade, but was actually mass-produced. While some details still required hand finishing, cheaper machine processes were used whenever possible. Manufactured by Haseler of Birmingham, these high quality pieces were a fraction of the cost of their handmade Arts and Crafts equivalents. Much of the line’s success can be attributed to the painter, teacher and designer of jewelry and metalwork, Archibald Knox (1864-1933). From 1897 to 1912 Knox designed not only jewelry but also a wide array of silver, pewter, carpets and textile designs for Liberty. As Liberty’s chief designer, Knox infused the Arts and Crafts aesthetic with Celtic inspiration from his native Isle of Man. His elegant adaptation of Celtic interlace became one of the most distinctive characteristics of the line. ‘Cymric’ jewels were produced in both gold and silver and often set with turquoise, blister pearl or mother-of-pearl or decorated with enamel. 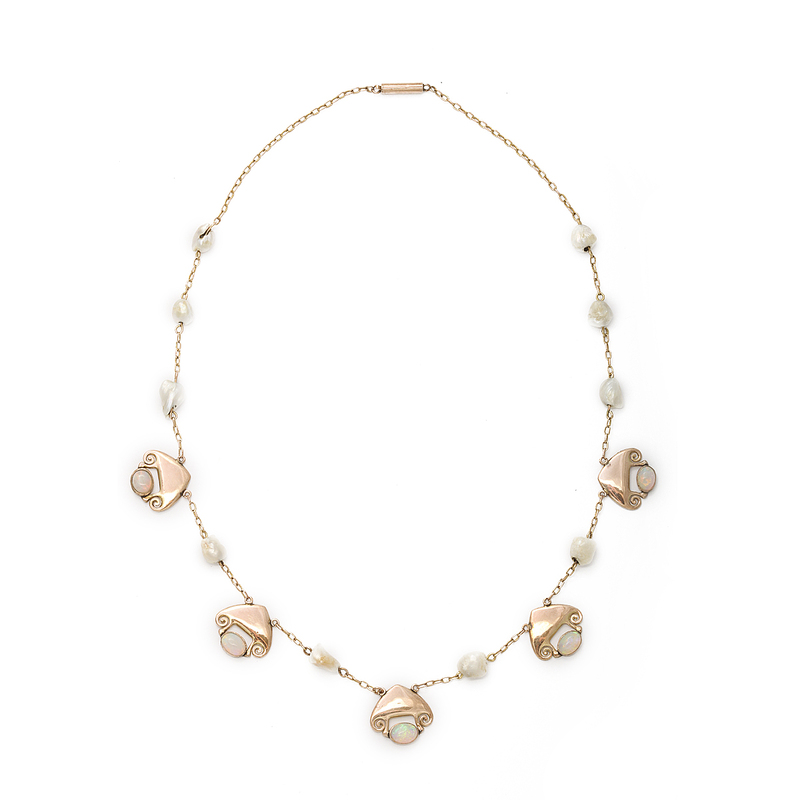 This blister pearl, opal and gold necklace ca. 1900, designed by Archibald Knox for Liberty and Co. illustrates many of the key characteristics, materials and techniques found within the ‘Cymric’ line of jewelry. 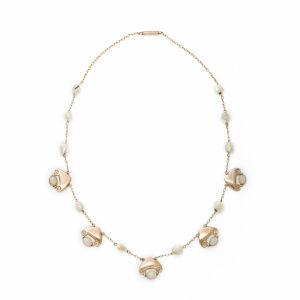 The chain and gold pendants on this delicate necklace were mass produced, while the setting of the opals as well as the pearls required expert hand finishing. Though not entirely handcrafted, the integrity of the design attests to the clever hand of its creator.